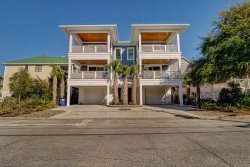 Beautiful first floor three bedroom, two bathroom unit at Carolina Beach. This second row condo was has recently been updated with granite countertops, luxury vinyl tile floor throughout, stone kitchen countertops and much more. Enjoy cooking a meal in the fully stocked kitchen and dining area with seating for 6. The master bedroom features a queen size bed, ceiling fan, and 43' smart TV. The attached bathroom has a walk in shower. The first guest bedroom has bunk beds (full on bottom, twin on top), ceiling fan, and a balcony with canal views. The second guest bedroom has a queen size bed, ceiling fan and a balcony with canal views. These two bedrooms share a full bathroom accessible through the hallway. This condo has two balconies, a view of the pool, and is located just across the street from the beach with close access. The front porch has a love seat and two chairs. There is also an outside storage unit for your beach toys. You can walk 5 blocks to the Carolina Beach boardwalk which has restaurants, bars, Britt's Doughnuts, firework display and carnival rides in the summer. This is a very convenient place to stay while enjoying the beach and local amenities. Parking for 2 cars onsite. 1st guest bedroom - Bunk beds with one twin and one full, ceiling fan, dresser, and closet. Balcony with canal views. 2nd guest bedroom- Queen size bed, ceiling fan, dresser, and closet. Balcony with canal views. Only half a mile from the Boardwalk! Wireless internet access is available with Roku TV's.